Note: The camera kinda washes out some of the colors, it looks much better in person. Villa Shopping Center in San Jose CA. I know where it is. Stevens Creek Blvd, on the San Jose/Santa Clara border. Cool that its still there, even if its in a state of dis-repair. 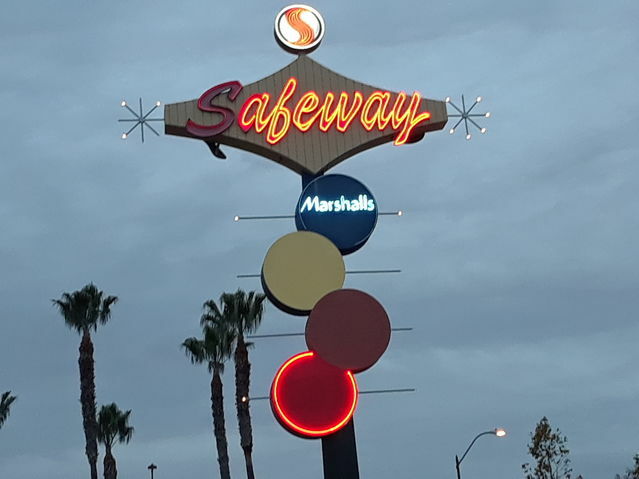 At night, anyone want to go to afeway? The S only failed a few weeks ago. Apr 28, 2018 at 12:16 PM Author: Cole D.
I'm assuming the Marshalls part must be fairly recent? Or is Marshalls older than I thought? Marshalls was started in 1956.. Very cool! Safeway used to been around my area up to early 80s (1982) and closed up.